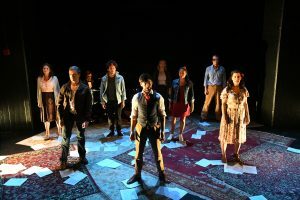 Brecht on Brecht is a monumental work that serves as an urgent invitation to – “change the world, she needs it.” In this production eight performers take us on an adrenaline fueled musical ride through some of Bertolt Brecht’s most powerful observations on social and political fall out. This “theatrical collage” has been woven together by George Tabori and serves to provoke us into deep introspection about the state of our current political climate. It’s a gift for those on the front lines, who are dedicating their energy to securing our democracy, to hear such poignant wisdom coming from someone who knows the face of totalitarianism up close. Brecht fled Nazi Germany for exile in the USA and his writing is saturated with warnings regarding the price of becoming silent in tumultuous times. Every fragment, poem, scene, interruption, song in this “epic theater” piece goads us into becoming present and engaged. It’s an intense workout for an activist’s heart. The musical choices are from Kurt Weill and Hanns Eisler with all lyrics from Brecht’s pen. Director Jim Petosa who is also the Co-Artistic Director of the Potomac Theatre Project (PTP) supplies some enlightening Brecht quotes in the program that served as a trampoline for the jumping off point for his production. I particularly resonated with “Art is not a mirror held up to reality but a hammer with which to shape it” and you truly feel the essence of this statement in the execution of this vital production. Petosa has injected a heightened pace into the work that feels like the surge of energy felt in a mass protest. The actors charge about the stage, transforming into a range of character’s who have a great need to impart their message to you – before its too late. Jim Petosa has done a fantastic job of creating this world of wisdom and has given us a necessary oasis in this global desert devoid of a moral compass. Thank you! The ensemble is riveting. Harrison Bryan, Christine Hamel, Carla Martinez and Jake Murphy are the four leads tackling the many scenes, monologues and solos. They are so vibrant and insanely talented. Christine Hamel has a beautiful, strong voice that can carry the weight of Brecht’s emotional complexity living in his lyrics. I particularly enjoyed her rendition of Kurt Weil’s Pirate Jenny. She also gave an exquisite performance in the devastating piece The Jewish Wife. Carla Martinez is a force on stage boomeranging around the space with the velocity of a Serena Williams serve. She broke my heart with her raw and real performance of Surabaya Johnny – hitting glorious pain spots in her vocal interpretation. Martinez also gave a heart wrenching retelling of Concerning the Infanticide of Marie Farrar. Jake Murphy is effervescent. He brings undiluted joy to the stage and seems to light up every corner of the space with his large presence. It was fitting that he should be the one to break the 4th wall in On Lighting as he had such a great rapport with the audience – “so give us light, let people see the way we work!” You could hear his resonant voice soar over the theater in every song. Harrison Bryan is a total delight to watch. He has truckloads of stage charisma and the ability to embody intense emotions with depth and honesty. Bryan has a truly magnificent singing voice which he used to full effect in the Ballad of Mack the Knife (however, I would urge him not to sing down onto his vocal chords so harshly in the last verse as it doesn’t serve the song or his instrument). Miguel Castillo, Olivia Christie, Sebastian LaPointe and Ashley Michelle function as the chorus as well as being the understudies to the leads. They all have sensational voices and create the moving tableaus for every moment of the show. Even though they didn’t get to sing solos or do monologues or scenes, they were ever present with excellent characterization, 100% commitment and unwavering focus. They were the engine powering the entire show. Ronnie Romano is both Musical Director and Pianist for the show and he doesn’t stop playing for a second. He is quite amazing to observe as he anchors the cast and lets them fly. He gives the performers all of his focus and sets the pace, mood and magic of the entire performance. The stunning production team for Brecht on Brecht includes, Hallie Zieselman (Set Design), Joe Cabrera (Lighting Design), Annie Ulrich (Costume Design) and Alex Williamson (Production Stage Manager). Running time: 1 hour 40 minutes with no intermission.